Heart of Red, Blood of Blue by Rebecca Belliston is a stunning young adult novel about an albino princess named Gisela. When her first betrothal ended with her betrothed dead and a war started, she was sent into hiding. But years later, after all her siblings were killed and she was the last child left of the king, she was betrothed yet again, to a man much older than her. One night she ran away so that she could be with the man she loved, but when he is slaughtered and she is taken prisoner by her enemy, Bloodless Kristoff himself, her life changes. In order to save her life, she lies about her identity. Will her enemies discover who she is? Will she be able to end the war? I really, really enjoyed reading Heart of Red, Blood of Blue by Rebecca Belliston. The book is incredibly well written, and I loved Gisela's point of view. I was hooked from the first page, and I never wanted to stop reading it. The story is filled with misdirection and plot twists, leaving the reader wondering what will happen next. The book also contained many suspenseful and exciting scenes. The story is action packed and super thrilling. The characters are all very complex and well written, which really adds to the story, and the relationships between them really make sense. The characters also have realistic wants that readers will be able to relate to. The ending will leave readers satisfied and happy. I really liked that the book had a page of background information at the end. I loved this book, and would definitely recommend it to everyone. Heart of Red, Blood of Blue by Rebecca Belliston is a love story and a story of war. Princess Gisela of Steinland is promised to Prince Jerrik of Kronga. However, Princess Gisela’s father desires the bounty of Kronga. He kills the prince and begins a ten-year war. Princess Gisela’s family is nearly wiped from the world by Bloodless Kristoff from Kronga. The princess is then betrothed to the king of another country to forge an alliance to aid Steinland in winning this war. The princess does not want this alliance and is determined to save her people, Kronga’s people, and herself. Surprises all the way to the conclusion. How can all this intrigue be wrapped up in the ending? Oh, you’ll never figure it out, until the last page. I loved Heart of Red, Blood of Blue by Rebecca Belliston. The opening hooked me. Great writing kept me turning pages as fast as I could. There were twists and turns everywhere, and none I could have predicted. Just a hint of mystery here and there added so much suspense. Belliston’s great writing kept me guessing what would happen next. Cliff hanger chapter endings, love, intrigue, and greed - I had a hard time putting this riveting book down. The cover is beautiful and the title ties well into the story line. I highly recommend Heart of Red, Blood of Blue to anyone wanting a book you can’t put down and a story which will have you begging for more. Heart of Red, Blood of Blue by Rebecca Belliston is a young adult romance novel. It tells the tale of Gisela, an innocent princess drawn into her father's political machinations with dire consequences. At a young age, she is promised to Prince Jerrik of Kronga. Unfortunately, her betrothal ceremony to him ends in bloodshed and many people, including the prince, are killed. A bloody ten-year war ensues. Her family is hunted down by the Bloodless Kristoff and her siblings are murdered one by one. Her father tries to marry her to a brutal king from another kingdom but she flees before the ceremony. Her sheltered and loveless childhood does not prepare her for the harsh life in the outside world. Will she survive? Can she do anything to end the war between the three kingdoms? The medieval-style setting provided an atmospheric backdrop to a great set of characters. I loved the dynamics between the main protagonists, Gisela and Ryder, and later on, Bloodless Kristoff. Suffice to say, nothing is what it seems and I was delighted with the way the story line took on several unusual twists and turns. 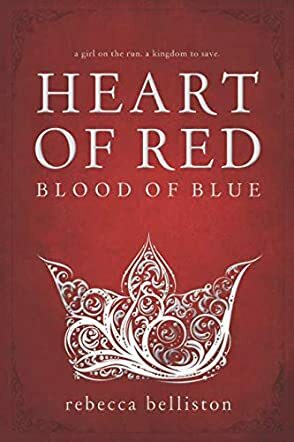 The vulnerable, the brave and the corrupt were blended within the pages of Heart of Red, Blood of Blue to create an epic historical drama which kept me reading late into the night. Rebecca Belliston writes a clean romance that will appeal to young adults and older readers alike. As a point of interest, the author has also created a piano solo soundtrack to accompany the novel, a piece which is well worth listening to.